Why do we need an article on how to find graves in Soldiers National Cemetery? Because it is easier to find plot numbers in books and articles than it is to use a plot number to find the grave! Surprisingly, this is not well documented. In later years, graves for non-Civil War veterans were placed beyond the periphery of the semi-circular design which has the Soldiers’ National Monument as its center. 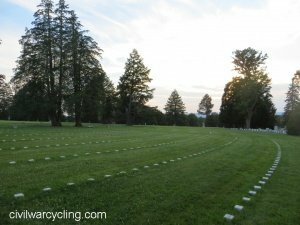 With so many books and articles that include the “plot numbers” of individual graves in Soldiers’ National Cemetery, you’d think it would be easy to find graves there. Not so. I searched for days looking for a map that would point me to “NY Plot B-14,” the grave of Sgt. Amos Humiston of the 154th New York. Of course, I could find the grave by walking up and down the entire New York section, but since I knew the row (B) and the grave number (14), I wanted a more direct approach. Show respect by parking your bicycle in a rack. Surprisingly, the signs in Soldiers’ National Cemetery do not explain the plot numbering scheme. They only point you to a general area, by state. Gravestones are not numbered. The stones themselves have abbreviated names, and sometimes the names are incorrect or incomprehensible. Most books and booklets either lack detailed maps or repeat the errors of other publications in a way that makes them useless for finding specific grave stones, by plot number. Finally, I found a great book that helped me to solve the puzzle: James M. Cole and Rev. Roy E. Frampton, Lincoln and the Human Interest Stories of the Gettysburg National Cemetery (Hanover, PA: The Sheridan Press, 1995). I highly recommend the Cole and Frampton book. 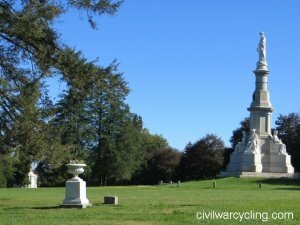 For a free online listing of Union burials, see “Union Soldier Burials” in the CivilWarWiki.Net article, “Soldiers’ National Cemetery (Gettysburg, PA),” last accessed April 6, 2017. With that reference, plus this article, you will know how to find graves in Soldiers National Cemetery. Using the Cole and Frampton book, plus my own experience touring the cemetery, I created the following schematic map. I tested this map against about a dozen plot numbers, and it works. The map is not to-scale. First, find the Soldiers’ National Monument. It is in the center of the map and looks like the image shown here. Face in the same direction as the Genius of Liberty statue at the top. Sculpted by Randolph Rogers (1825-92), the Genius of Liberty represents liberty’s challenge to reconcile war (the sword in one hand) with peace (the wreath in the other hand). 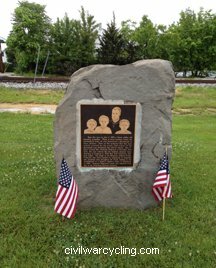 The monument’s cornerstone was placed on July 4, 1865, and it was dedicated on July 1, 1869. The best way to learn how to find graves in Soldiers National Cemetery is always to begin at the national monument. While standing in front of the Soldiers’ National Monument, notice how graves are arranged in concentric semi-circles from the monument’s center. Each state has its own section, plus there are sections for “unknown” soldiers whose remains could not be assigned to a state. 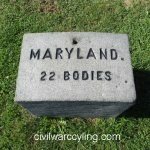 Each state’s section is marked with a raised stone similar to that of the Maryland marker, shown here. The state’s unidentified Gettysburg dead are buried here. The stone also marks the beginning of the state’s cemetery section, behind which flat gravestones for individual soldiers are arranged in rows. This is where things start to get confusing. The cemetery’s plot numbering scheme is based on the arcs of two concentric circles that each have a set of rows. Our map makes this clear, but it is not at all obvious to the cemetery visitor. The key to finding a specific gravestone (like “NY Plot B-14”) is first to find the state’s raised stone marker (see Step 2, above) and then to find the row (see below). 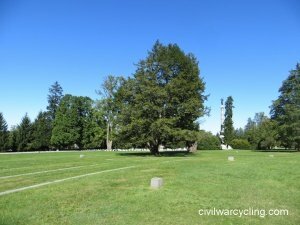 To master how to find graves in Soldiers National Cemetery, it is very important to remember that there are two arcs that are separately numbered. 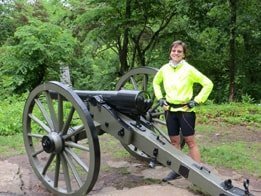 The inner arc includes Illinois, West Virginia, Delaware, Rhode Island, New Hampshire, New Jersey, Wisconsin, Connecticut, Minnesota, Maryland, and the U.S. Regulars. The inner circle has four rows that are each identified by a capital letter. If you are looking toward the graves from the state’s raised stone marker (or the base of the Soldiers’ National Monument), the rows for the inner arc are named (in order) D-C-B-A. The outer circle includes Maine, Michigan, New York, Pennsylvania, Massachusetts, Ohio, and Indiana. The outer arc has seven rows that are each identified by a capital letter. 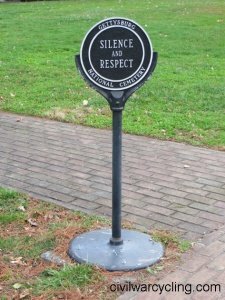 If you are looking toward the graves from the state’s raised stone marker, the rows for the outer arc are named (in order) G-F-E-D-C-B-A. Note: From the base of the Soldiers’ National Monument, you may not be able to see where the inner arc ends and the outer arc begins. The grave markers and historic signs in Soldiers’ National Cemetery do not identify rows (with letters, A-G), nor do they provide grave numbers. Once you find a grave’s section and row, the visitor must count graves from right to left. For me, this was counter-intuitive, but it is important part of knowing how to find graves in Soldiers National Cemetery. NY Plot B-14 is in the New York section, which is in a wide outer arc to the north of the Soldiers’ National Monument. 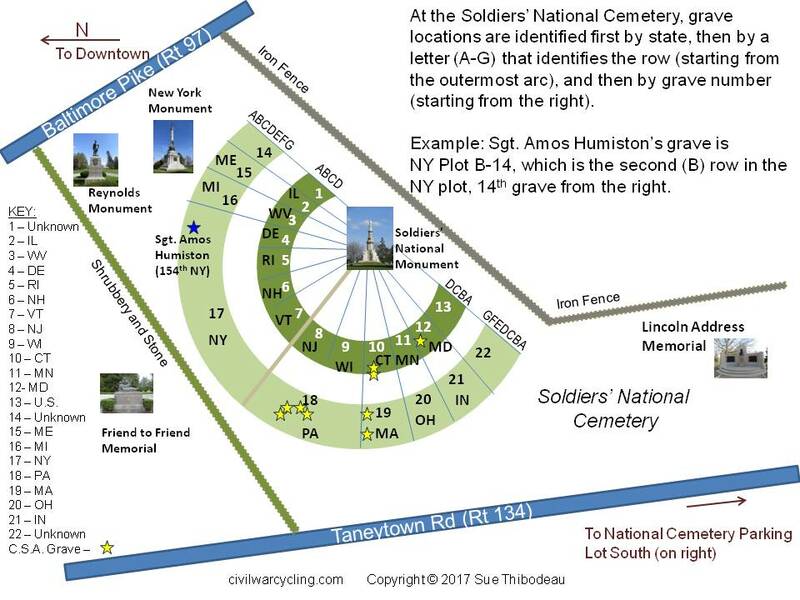 NY Plot B-14 is in the “B” row, which is in the second to last row away from the Soldiers’ National Monument, in the outer arc. NY Plot B-14 is the 14th grave from the right in the second to last (“B”) row away from the monument, in the New York plot. Here is something fun to try: Point your web browser to https://www.google.com/maps. Enter “39.82057, -77.23139” (without the quotes) into the “Search Google Maps” field. Then select Search. 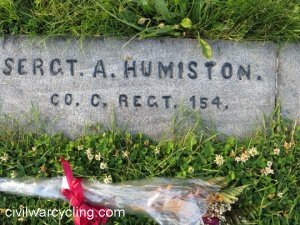 You should now see the location of Humiston’s grave on a Google Map. More than three months after the Battle of Gettysburg, Sgt. Humiston’s wife Philinda learned that Amos had died. She recognized her children’s portrait printed by a newspaper that was trying to identify the unknown soldier from New York. The soldier was Amos and the “children of the battlefield” were Frank, Frederick, and Alice Humiston. Amos Humiston was born in Owego, New York, in 1830. 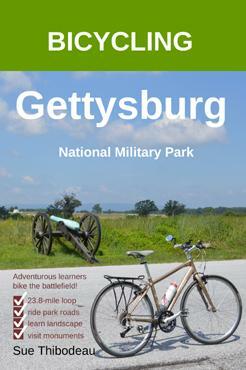 At Gettysburg, he fought with Col. Charles Coster’s brigade (1st Brigade, 2nd Division, 11th Corps, Army of the Potomac). He died in the streets of Gettysburg on July 1, 1863, while covering for retreating Union troops near the end of the first day of the battle. Humiston’s dead body was found clutching an ambrotype portrait (a print on glass) of his three young children. His death is memorialized by a large stone marker that is immediately south of the railroad tracks that cross Stratton Street, not far from the Coster Avenue monument to the 154th New York Infantry.